I think this is what it sounds like when an orchestra goes Heavy Metal (sorry Metallica and the San Franciso Orchestra, but I just wasn’t impressed, if anything I thought you sounded more watered down than the originals). The score strikes a balance between heavy action tracks and quieter reflective pieces. “Broadcast”, “Foreside”, and “Farewell” are nice quiet pieces. But let’s be honest here. 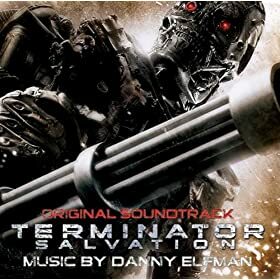 When it comes to Terminator soundtracks, we want the battle music! “The Harvester Returns”, “Hydrobot Attack”, and “Final Confrontation” are the best during-battle music. “No Plan” and “Marcus Enters Skynet” are heavy, but don’t quite have that “constantly heavy, get your blood pumping” feel to them. If you like this you’ll probably love “Wolf Suite pt. 1” from Elfman’s other work, The Wolfman.